Ryder checking out great grandpa. 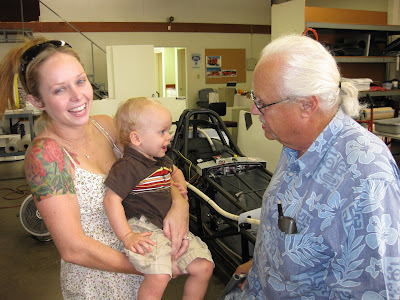 Great-grandpa with Ryder and Amanda. On Wednesday I drove down to dad's shop to watch the guys lay the new floor in the offices. Well, one thing led to another and we had to hire a plumber ($1200) because none of the water valves worked in the entire building. And he'll install the new toilets we brought. The shop is half empty. Erik and Robert came by and tore down 2 large shelf units and removed them. Here's a short clip of Erik. Amanda came by to visit and brought the fast and furious "Ryder". He is interested in tires and anything that rolls, I wonder where he gets that. He's just a busy and inquisitive little guy.. Your car is gone - Shannon - Amanda bought it. Awe!!! i want to put these videos and pictures with grandpa on my myspace!! !